All Double Spray Type. In addition to Quartet series, all double spray Spark series is available as all double flowers without double single selection. Over 90% will be double flowers. Cream yellow and white are available. 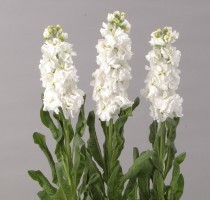 Compared to Quartet White and Yellow II, Spark White II and Yellow are about 10 cm taller but flowering is delayed by 10 days and 14 days respectively. All double standard type. All double Arrow White flowers slower than Revolutions but produces stronger and taller flower stem. It has voluminous flower spike and pure white flower color. All Double standard type. Mr. Kurokawa has bred high quality, all double varieties. Revolution White Ⅱ and Revolution Yellow Ⅱ are very early flowering. Without selection work, over 90% will be double flowers. 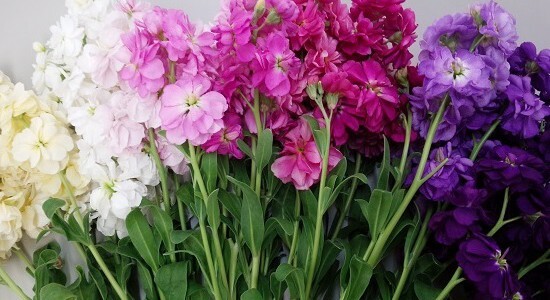 Quartet series is early to bloom and scented with very sweet fragrance. Its outstanding characteristics such as a strong branching habit and hard stems make it an excellent choice for flower bouquets and decorations. Pinching is required to make a well-balanced spray form. As the series name implies, it flowers earlier than Iron series and at the same time, ideal traits of Iron series remain such as very tight flower spikes and iron like hard stem. The series is very early flowering. Iron series is highly preferred because of its excellent quality. As in the name of Iron, the stems are like iron and very robust. It produces excellent tight flower spikes and the top of it does not stretch. Iron need more water than other varieties to have marketable length. Kid series is very early flowering which enables early harvesting and it is even earlier than Iron series. Kid White is one month earlier than Iron White and 10 days earlier than Kid Yellow. Kid series is not only fast but also the stem is rigid and the spike is tight just as good as Iron series. # Please contact us for the best sowing time in your region to avoid premature flowering as the series is very early flowering.